You’re in the kitchen looking for a snack when suddenly, from out of nowhere, a bag of potato chips appears and forces you to empty its salty, fatty contents into a bowl. OK, maybe it didn’t just appear. Maybe you grabbed it when you opened a cupboard. And once those chips are in your hands, well, what else can you do besides munch on them? You’re hungry, and they’re RIGHT IN FRONT OF YOU! Here’s something else you can do: Move those chips to the out-of-the-way cupboard where you’re keeping the rest of the junk food. That way, with World Health Day just around the corner, it can’t sneak up on you at snack time and derail your awesome plan to eat healthier. Knowing your enemy means knowing where it lurks! You could just toss all the junk in the trash, but food isn’t cheap, and wasting it isn’t how you roll. Besides, treating yourself to a handful of chips or a doughnut once in awhile isn’t the end of the world. In fact, research suggests this can actually help you stick to a healthy eating plan. Controlling cravings isn’t easy, and if you never satisfy those cravings it can be tempting to bail out completely. You’re only human, right? That’s where the junk food cupboard comes in. If you’ve managed to ignore it all week, you’ll know exactly where you can find a well-earned reward — and that will make the remaining days that much easier. 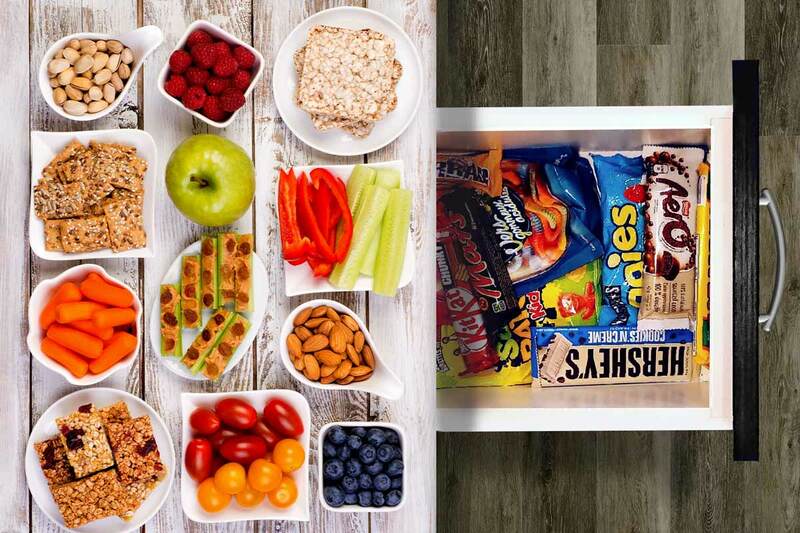 Because snack attacks hit daily, not weekly, it’s important to replace the stashed junk with tasty, healthier options that fill the hunger gap. While those chips sulk in the cupboard, have a bowl of salted almonds or cashews sitting on the counter. Nuts contain healthy fats and more fiber and nutrients than potato chips, so you can eat less and feel full for longer. What about those packaged doughnuts? Juicy oranges, tender bananas and crunchy apples are all deliciously sweet, packed with nutrients, and will tide you over better than deep-fried dough. Put some fresh fruit in a bowl next to the nuts, and hey presto: You’ve got a healthy snack smorgasbord! If you wondering how to make healthy snacks at home, these options show how easy it is. Check out these other awesome ideas for healthy snacks in the morning, in the afternoon, after work and at bedtime. When the junk cupboard starts looking bare, replace what’s missing with healthier options. Now that you’ve got a taste for fresher, more nutritious snacks, you’ll find yourself reaching for those items instead. Feeling healthier and looking better will seal the deal! At this point, you’ll understand why healthy snacks are so awesome. What little junk food remains in the cupboard will just look sad and pathetic. So put it out of its misery by tossing it in the trash. Throwing away food still isn’t how you roll, but now you appreciate the difference between REAL food and junk! Where do you put junk? WHERE IT BELONGS! Do you have a healthy snack tip you’d care to share? Go right ahead in the comments below! Another issue that arises is allergies, being a sufferer myself it becomes very easy to gravitate towards junk food. I have a nut allergy so I try to replace that with raisins as a quick go to. Why are you using grey lettering ? I find it very difficult to read. Black would be much better.